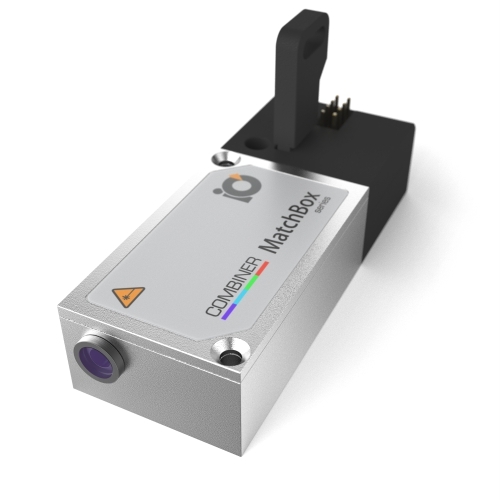 A widely configurable 4-wavelength dichroic combiner featuring precisely co-aligned optical paths in a free-space output configuration. All optics and electronics fitted into the ultra compact 'Matchbox' housing. This particular configuration provides up to four wavelengths, which are standard for use in Life Sciences, Food, Metrology and Medical applications. An easy to use PC interface and separate TTL inputs allows full control over the individual wavelengths. 1 Noise level is measured with a fast photodiode connected to an oscilloscope. The overall system bandwidth is from 2 kHz to 20 MHz.